It’s the year 1350, and sailing through the Indian Ocean unforgiving winds have slashed your sails and cruel currents are pulling you into unchartered waters. In the searing heat of morning you drift towards a densely vegetated land, a shelter to recover from moonlit storms. The temptation to explore and the need for fresh water encourage a search party to forage through the unknown. Madagascar was the land that time forgot, a mirror into the prehistoric. Its separation from Africa 135 million years ago and India 88 million years later created an unparalleled experiment in biodiversity. God-fearing sailors would have been met by aptly named Elephant birds over 10ft tall and weighing 400kg. Their foot-long eggs would have fed an entire crew if they were brave enough to raid a nest. Lemurs the size of Gorillas ruled the canopy, pulling their 200kg bodies amongst thick branches in the search for green leaves and berries, their only predator an oversized mongoose with a bone-crushing bite. Below in humid swampland, pygmy hippopotamuses pulled from the pages of fairy tales wallowed in noisy groups, each standing no taller than a Labrador. In isolation, these species flourished and evolved with unique genetic blueprints found nowhere else on the planet. Many of their ancestral counterparts can be identified in Africa and India, but Madagascar was undoubtedly blessed with a remarkable biodiversity that only a force such as mankind could belittle. As man settled on the island, the indigenous fauna was devastated. 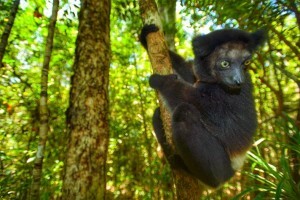 At least 17 species of Lemur have become extinct, along with the mighty Elephant bird, Malagasy hippopotamus, giant fossa, and the rainforest itself has been decimated. Only 10% of Madagascar’s original habitat remains whole in the wake of deforestation for rare timber, agricultural reclamation, and the collection of fuel wood. This is why it is more crucial than ever to support communities, their economies, and ultimately the precious wildlife and landscape surrounding them, through the simple brilliance of ecotourism. Despite the human impact, Madagascar is still home to 107 species of lemur (20% of the world’s primates), Baobab trees straight from a fantastical Disney animation, mysterious Tenrecs that resemble an otter-hedgehog hybrid, and the world’s smallest species of reptile. In fact, 5% of the world’s biodiversity can be found on Madagascar, which is unbelievable considering it accounts for only 0.4 % of the world’s land mass. Lemurs are definitely the most iconic group of animals on Madagascar and are found nowhere else on earth (apart from small populations that were introduced to the nearby Comoros Islands). The largest living lemur species is the Indri (9kgs) with an enchanting call that will give you goose-bumps each time you hear it. The smallest lemur is the nocturnal Madame Berthe’s mouse lemur (30g), which is the smallest species of primate in the world and incredibly difficult to spot. Between these are many weird, wonderful and unbelievably charming species that will mesmerise you endlessly whilst exploring the 1,000 mile long island. It was an unforgettable experience going out at night in search of the Aye-Aye, Madagascar’s most deviant looking lemur. It is the world’s largest nocturnal primate and resembles a real life gremlin. Watching it feed under the white light of your head torch, its wiry fur, buck teeth, bat-like ears and elongated fingers caressing insects, you could easily forgive locals for regarding the Aye-Aye as an omen of evil. 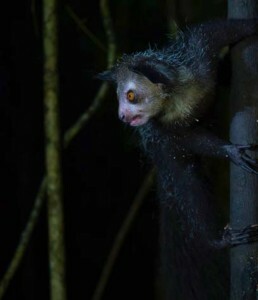 However, you should remember than no one chooses how they look and leave the Aye-Aye to its midnight feasting on grubs! At the other end of the lemur scale is the Gray Bamboo Lemur. With their huge eyes, fluffy coat and comically expressions, the words ‘I want one’ are never far from mind. However, their appeal is actually detrimental to their success as about 28,000 lemurs are kept illegally as pets in Madagascar. 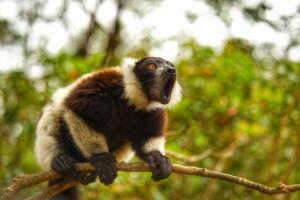 Like all primates, lemurs are social animals and being kept alone in a house with humans is usually a recipe for disaster. 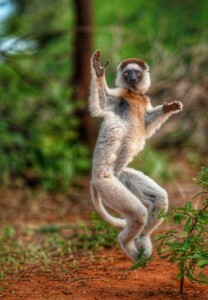 The Verreaux’s sifaka, otherwise known as the dancing sifaka, may be the most wonderful species of lemur. When they are on the ground, they travel on two-feet like a human but with the grace of a professional ballerina. If you’re able to film this movement in slow-motion the beauty of their passage is exacerbated even further. Although Madagascar will draw many for the delights of its enchanting Lemurs, there is plenty more that the island offers for both the brave and faint-hearted. 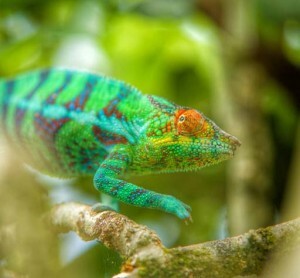 As someone who loves reptiles, Madagascar’s brightly coloured chameleons, non-venomous snakes and rare tortoises will constantly delight. Furthermore, no trip to Madagascar is complete without a trip to the Avenue of the Baobabs. These ancient trees are most spectacular when viewed at sunrise or sunset, casting spectacular silhouettes against the burning red skies. The island has nearly 5,000km of beaches which rival the beauty of those found on the nearby islands of Reunion and Mauritius. The diving is world-class and never crowded. 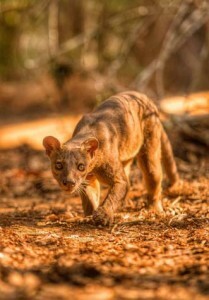 Finally, if you’re lucky, you’ll get to witness the only large carnivore on the island – the Fossa. This animal looks like a big cat, but in fact, it’s most closely related to a mongoose. I’ve travelled to over 60 countries in my 30 years on earth but none have impacted me quite like Madagascar. I’ve become spellbound by its distinction but I’m afraid for its future. 30,000 hectares of forest are being cut down each year and, if this rate continues, there will be no forest left within 25 years. 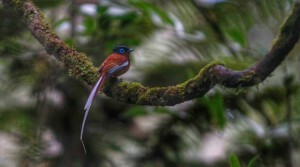 Ecotourism is a viable way to make the forests worth more to the local people than turning them into agricultural land. If the Malagasy people can make a good living from guiding tourists through the forests and showing off the besotting animals it hosts, they are far more likely to protect them for many more generations. Let us learn from the mistakes of our forefathers, the bones of the Elephant bird, the museum displays of pygmy hippos. Our world is worth so much more with magical species still swinging from trees, patrolling the grasslands, and swimming through seas. 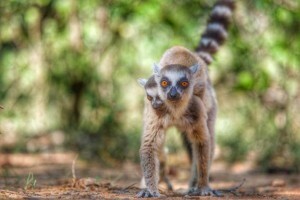 If you’d like to visit Madagascar, you can book a tour with Encounter Madagascar . 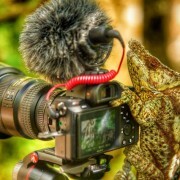 I travelled to Madagascar in October (the dry season). The best months to visit are April – November. Things to note are: the roads are poorly maintained so be prepared for a bumpy ride, the accommodation is basic in some of the reserves so don’t expect luxury and Air Madagascar has a tendency to change internal flight times at the last minute so always check before you travel.